After being diagnosed with a prostate disease, men and their families often want to know how others with the same condition fared after choosing a particular treatment. 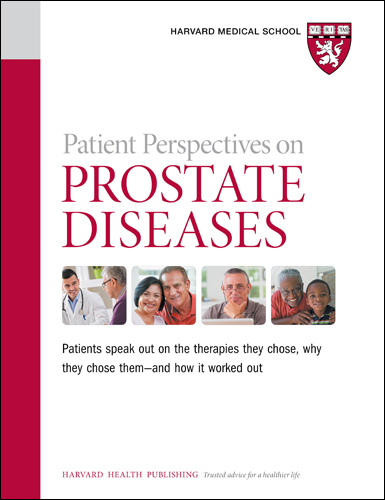 Patient Perspectives on Prostate Diseases addresses that need. You’ll learn about the steps a dozen men took in selecting a therapy, and find out how those treatments affected their long-term health, wellness, and happiness. You’ll meet a man who overcame BPH with a surgical option (but offers an important caution), men who selected active surveillance, two men who chose different prostatectomies for prostate cancer—with very different outcomes, and men who experienced and overcame complications of incontinence and erectile dysfunction and more. Patient Perspectives on Prostate Diseases is a compilation of our patient interviews from the past decade, along with updates describing how each of the men we spoke with is doing now. The rationale is simple. After being diagnosed with a prostate disease, men (and their families) often want to know how others with the same condition fared after choosing a particular treatment. This report responds to that need: we learn about the steps men took in selecting a particular therapy, and find out how those treatments affected their long-term health and well-being. 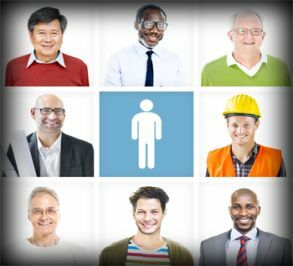 Our goal with this report was to assemble a representative sampling of men with varying stages of prostate diseases, with follow-up long enough for our readers to understand the consequences of their treatment decisions. (known medically as benign prostatic hyperplasia, or BPH), which afflicts most men as they get older; prostatitis, which can accompany BPH; and prostate cancer. We also learn how men manage the complications of treatment, such as incontinence and erectile dysfunction. And we speak with wives and partners, to learn more about how a man’s prostate disease influences his personal relationships, and how those relationships can in turn help men recover and lead fulfilling lives. With one exception, names and biographical details were changed to protect privacy. Most of the men we spoke to are pleased with their decisions. Others would have chosen differently knowing what they know now. Our aim with this report is to help men learn from one another, so they can choose a therapeutic approach that fits best with their individual circumstances and lifestyles. Many prostate cancers grow slowly and do not pose a substantial risk to survival, especially among older men, who are more likely to die of another cause than the cancer. After consulting with their doctors, men who have lowrisk prostate cancer may choose to avoid treatment in favor of having their tumors monitored with active surveillance. Men on active surveillance undergo routine digital rectal exams (DREs), tumor biopsies, prostate-specific antigen (PSA) tests, and in some cases, magnetic resonance imaging (MRI) scans of the prostate to check for tumor growth. Treatment is initiated only if and when their tumors begin to spread. Here, we present the experiences of two men who have each been on active surveillance for more than 20 years. Our first interview is with Jeffrey Caruso, who describes results from his long-term monitoring and the potential triggers that would cause him to seek treatment. In 1997, when he was 57 years old, Jeffrey Caruso had a PSA test after his physician recommended it as part of his annual check-up. The result—3.9 ng/ml—raised some concern because it fell at the upper end of a normal PSA range of 0 to 4 ng/ml. Jeffrey and his doctor decided to keep testing the PSA to monitor it. The next year, Jeffrey’s PSA had risen to 4.4 ng/ml. Anxiety set in, and Jeffrey began seeing a urologist, who monitored his PSA and performed DREs. During one of these exams, the urologist noted that a small part of the prostate seemed slightly firmer than the rest, a possible sign of cancer. In 1999, Jeffrey had his first prostate biopsy. It was negative, meaning that it found no cancer. However, Jeffrey’s PSA continued a slow climb. By 2005, it hit 5 ng/ml, and a DRE revealed a pronounced hardening of one area of the prostate. Jeffrey underwent a second biopsy. This one revealed cancer with a Gleason score of 3+3 in a single biopsy core. At this point, Jeffrey was 65 years old and had tough decisions to make. Our initial interview with him, which follows here, was in 2008. We also include some of his later updates from 2009 and 2014, along with a brief update for 2017. Q: How did you react to the prostate cancer diagnosis? Jeffrey: I probably had the same reaction anyone else would: panic and fear. Later, I became depressed, asking “Why me?” I also had a very strong urge to do something immediately. My urologist said that I qualified for surgery and that he could perform the procedure, but that radiation and active surveillance were other options. Q: But you didn’t have surgery to remove the prostate. Why? Jeffrey: I was ready to at first, but then I went to a radiation oncologist who recommended brachytherapy, which treats cancer by putting radioactive seeds into the prostate. Then another oncologist said that with my early-stage cancer, I could wait up to a year to make a decision. After that I calmed down and started reading a lot about prostate cancer and the available treatments. That’s when I became increasingly aware of the potential side effects of various treatments.